Wishing you a very happy, prosperous,beautiful and wonderful New year friends which brings you all loads of happiness, health and more wealth..
Time flies and this year ran away really very fast, cant believe that we are already going to step in 2010..When i started this blog, i was thinking that i cant stay in blogsphere more than an year, which is completely wrong, yeah i have been here almost about one year and 4 months and with more than 850posts from 30th august 2008..Am really very proud of my culinary adventures also its time to say a big thanks to all my blogger friends and readers who were really kind to send their encouraging words to keep me around in this blogsphere.. Personally 2009 was completely a beautiful and fantastic year in blogworld, yeah got a bunch of great friends with whom had a great virtual time by going through their blogs and commenting all these beautiful virtual tempting treats which was quite my daily routine nowadays, and am completely addict to this blog world..Thanks to my friends for pulling me to enter this blogworld which keep me alive even when i across few storms in our daily life.. This year, i went addict completely to a famous grain called Oats and also tried many beautiful and healthy grains like barley, wholewheat flour, corns,oats etc and as usual tried many eggless, vegan bakes with various combinations and to be honest i truly learned how to bake healthy through this blogworld..Am really proud to say that my hard work doesnt put me down, i won two cookbooks this year and a cash amount through Madhuram's baking events..
Ec of Simple Indian Food was kind enough for showcasing my blog and myself through her beautiful super sunday blogger where she posted my interview here..Needless to say how happy i am..Thanks a lot to EC for doing this tremendous work for featuring both veteran bloggers and new bloggers in her blog on Wednesday and Sunday.. I have guest hosted almost 6 famous events and am hosting rite now another famous AWED event portuguese as theme...Thanks to Sunshinemon, Srivalli,Maheswari,Pallavi,Lakshmi,Sunita & Dk for letting me to host those wonderful events..Yea u can see the roundup FIC-Pink1,FIC-Pink 2,FIC-3,MEC-Savoury Snacks,AFAM-Olives,AFAM-Bellpeppers,Sunday Snacks -Snacks With Bread,RCI-Kongunadu & finally Think Spice-Think Coriander Seeds, these events are went through my blog and currently am hosting AWED.. Here comes few of my recipes which have been most commented,liked and appreciated by both my blogger friends and my family.. Many of my dishes have been tried and tasted by my blogger friends and readers, i really appreciated them for trying my recipes and leaving me their appreciations...I need all ur supports and encouraging words along the coming next years and i know that my friends will be there for me to give their supports in future..
Once again wishing you all a Fantastic and Excellent 2010!!!!! Am sending this post to Srivalli's Best Of Year 2009..
A king cake sometimes called as king's cake or three kings cake is a type of cake associated with the festival of Epiphany in the Christmas season in a number of countries.. It is popular in Christmas season in France, Belgium and Switzerland etc. The French king cakes have a small trinket often a small plastic baby, sometimes said to represent Baby Jesus inside, and the person who gets the piece of cake with the trinket has various privileges and obligations (such as buying the cake for next year's celebration).In France, the cakes can be found in most bakeries during the month of January. The cake consists of flaky puff pastry layers with a dense center of frangipane ( a cream prepared with almond powder,eggs, butter, sugar and almond essence)..The cakes are usually sold in special bags, so that can be used to heat the cake in a microwave without ruining the crispness of the cake. A paper crown is included with the cake to crown the "king" who finds the trinket in their piece of cake. To ensure a random distribution of the cake shares, it is traditional for the youngest person to place themselves under the table and name the recipient of the share which is indicated by the person in charge of the service.The person who gets the trinket is declared the King or Queen of the day. Every year we used to buy this king cake and this year i prepared at home to give a trial, the cake turned out fantastic.. Beat the butter, sugar together in a bowl until they turns soft, add the eggs one by one and finally add the almond powder & almond essence, mix everything well and keep the bowl in fridge for half an hour. Preheat the oven to 400F, line a baking tray with a baking sheet, add the milk to the yellow egg yolk and beat well. Place a puff pastry sheet ,brush the edges of the pastry sheet with the egg-milk mixture..pour the already prepared almond mixture over the pastry sheet and spread them evenly,dont spread over the brushed egg mixture. Make a small hole in the middle of the pastry sheet and with a knife make some lines over the pastry sheet as ur desire, brush now the pastry sheet with the remaining egg-milk mixture and bake in middle rack of the oven for 20-25minutes or until they turned brown. Brownies!! yummm just love them, but i was quite freaky to try out those droolworthy brownies with loads of butter...I tried out this tempting and delicious oats brownies with oatflour, whole wheat pastry flour,less butter and with applesauce which turned out this yummy brownies too fantastic...I prepared the oat flour at home by grinding as usual the quick cooking oats and with whole wheat pastry flour this brownies turned out fabulous, we just loved it...Also this brownies are eggless but not vegan as i used milk and butter to make out these oats brownies...Healthy also tasty brownies when served warm, definitely a guilt free brownies..
Heat together chocolate pieces and butter together in a microwave safe bowl for 5minutes in medium..take off the bowl and give stir..now add the baking powder, sugar, baking soda and beat well the sugar gets well dissolved..add milk and applesauce to the chocolate mixture, give a stir..
Preheat the oven to 350C... finally add the whole wheat pastry flour, oats flour, chopped walnuts and almonds to the chocolate-sugar mixture, mix slowly...dont overmix..Pour the chocolate batter to a greased cake pan and arrange in the middle rack of the oven...Springle few almond flakes over the batter and bake for 25-30 minutes or until the toothpick inserted comes out clean.. Simple fried rice which goes for easy ingredients which tastes really fantastic, prefect rice for lunch box menu also for quick lunch..I prepared this rice with green spring onions and with quite simple spices with few fried cashew nuts and already cooked basmati rice, this rice is really very easy to prepare and am damn sure that everyone at home will definitely love it..I was really breaking my head to give a name to dish since its ressembles quite like pulao and also like fried rice, finally i finished by giving the name as fried rice...We had this yummy and flavourful dish with chicken kurma, both together worked out wonder and tasty and had a delicious lunch..
Heat enough oil and let splutters the mustard seeds and cumin seeds, add the ,cashew nuts,chopped ginger, chopped onions and chopped green chillies and saute until the onions turns transculent..add immediately the salt, garam masala powder,turmeric powder and cook for few seconds..add the chopped spring onions and just cook for 2or 3seconds(dont over cook the spring onions), finally add the basmati rice and toss gently until everything get well mixed.. Serve with any spicy gravy..
Hope u had a great weekend and enjoying ur holidays with ur families and all...we had a great weekend and had a wonderful saturday with our family members, here is a simple but cheesy savoury corn muffins i prepared today for our lunch and served with salad after having many heavy festive foods like cakes and chocolates..This corn muffins is really very simple, easy and tasty quite a prefect muffins while they are served with simple salads prepared with grated cheese, all purpose flour, stone ground cornmeal, parsley leaves, chopped chives, cumin powder& pepper powder..While having this muffins needless to say how delicious and cheesy these muffins were, those melting cheese tastes divine and we enjoyed having this savoury cheesy corn muffins..
Preheat the oven to 350F and grease the muffins mould...Mix together the all purpose flour, yellow cornmeal, pepper powder,cumin powder salt, baking powder and baking soda together.. now add the grated cheese, chopped parsley leaves,chopped chives and spring onions to the dry ingredients and gradually add the olive oil and turn everything as crumble like mixture, slowly add the milk, mix everything well until they turn as thick batter..
Pour the batter to muffins mould, i used the 12 muffins pan,place a piece of green chilly over the unbaked batter..arrange the muffin pan in the middle rack of the oven and bake for 15-20minutes until the muffins turns golden brown or a skewer inserted come out clean..
Christmas without yule log cake is not complete, usually every year we used to buy either icecream yule log cake or cream yule log cake, this year i really want to give a trial to make out this famous yule log cake at home..Even few small hands helped me to whisk the egg whites and helped me a lot to prepare this delicious chocolate yule log cake which was my first attempt,this cake turned out best and good for the first attempt..I was really happy for this trial at home and my lil ones were really happy to enjoy their mom's frist yule log cake, which they relished each and every spoon..As its was my first attempt of this yule cake, i was quite anxious and really dont want to trash if it goes wrong, so i tried for a small yule log cake and it vanished within few hours when i served for our christmas dinner..here is some clicks which i really have to request to my dearies to wait and i clicked few clicks to show u all my first attempt of this yule log cake with chocolate frosting..
Preheat the oven to 250F..Separate the eggs whites and egg yolks..beat the egg yolks,butter and sugar in a bowl until they turns smooth and pale yellow creamy mixture, add slowly the flour and mix everything well...Meannwhile beat the egg whites separately with a pinch of salt until they turns foamy; gently fold the egg whiles to the already prepared flour mixture and mix everything well..pour the mixture in a tray lined with greased baking paper..bake for 15minutes...immediately roll the baked cake in a slightly wet towel and let it get cool..
Heat the chopped chocolate pieces with water in a microwave bowl for 3minutes high in microwave oven, take the bowl and mix well, add the butter and confectioner's sugar to the already melted chocolate,beat and turn everything as soft mousse, cover the bowl with a lid and conserve in fridge for an hour..
Once the cake roll get cooled...with a spatule spread the chocolate frosting over the cake roll..roll again well the cake roll..spread well the remaining chocolate spread over the rolled cake roll..with a fork make some lines over the frosting and arrange in fridge for two or three hours..I springled few chocolate vermicelli and confectioner's sugar before arranging in fridge. We are all excited to open our gifts tonite and i am very eager to open my gifts,really awaiting..I prepared this crunchy cornmeal cookies yesterday as everyone at home are in holiday except my DH, yeah he is still working today..fortunately he doesnt work for a week after today's work..Its kinda hard to work and woke up early morning here, todays its was too cold and slightly snowy here..Thank god, we r going to have a great time for a week soon..Coming to this cornmeal cookies, i prepared simply with butter, cornmeal, all purpose flour, sugar and vanilla extract with baking powder and they turned out really crispy and delicious..We loved it and it was completely eggless, once u have them this cookies melt in your mouth and were really crispy..
Preheat the oven to 350F, line a baking sheet over a baking tray, keep aside..In a large bowl, beat together the butter and the powdered sugar until they turns creamy, meanwhile mix the flour,baking powder and cornmeal together and keep aside..gradually add the flours,vanilla extract to the butter-sugar mixture and knead as soft dough, cover the dough with a lid and arrange in fridge for an hour...Make a small balls from the dough and arrange over the baking sheet with enough space..bake for 15-20minutes until they turns golden brown.. I was planning to prepare some easy pulao with paneer cubes which i picked when we went to Indian groceries before a week...I really felt that store bought paneer packets are quiet easy and handy for making out any gravies or any other dishes when we are really craving for paneer dishs..I was bit lazy to prepare paneer at home,fortunately i can buy paneer packets here which wasnt that much easy before few years ago, i can definitely say that i can get any Indian spices or any other Indian veggies very much easier when compared few years back..Coming to this saffron paneer pulao, i prepared this fabulous zafrani paneer pulao for our sterday's lunch with some fried papads and chicken 65 and had a fantastic lunch..This pulao is very simple, but rich in flavour quiet easy to prepare and delicious with mild minty flavou...This paneer pulao suits incredibly for any get together, or any parties and y not as simple lunch box menu..This pulao is definitely very worth to try and we loved it. Soak the saffron strands in hot water and let them sit for half an hour..Heat enough oil in a large pan, add the shah jeera,let them crack..add immediately the chopped onions and stir until they turns transculent, now add the slit opened green chillies and chopped mint leaves, saute until the mint leaves shrinks...meanwhile heat few drops of oil and fry the paneer pieces on both sides until they turns golden brown, keep aside....Add the garam masala powder, cumin seeds powder, pepper powder,soaked saffron water to veggies and toss until the spice powders get well mixed...now add the already cooked basmati rice and toss gently also add the already fried paneer pieces to the rice and spices, toss everything gently.. Serve hot with any spicy side dish.. Popcorn is a type of corn which explodes and puffs up when the corn kernels are heated, this method of popping corn was discovered by Americans and its became a popular snack food especially in movie theaters..Corns are able to pop becauce of their kernels which have hard moisture sealed hull and dense starch filling this allows pressure to build inside the kernel until an explosive pop happens..Some consider it as a healthy food and its widely consumed in front of TV and while watching movies..I have a electric appliance to pop up the corn kernels which i get from supermarkets and i used to pop them at home as per our need..My lil ones usually ask me to prepare the same sweet and buttered popcorns we get from the movie theaters, to be honest i was planning to make out those crunchy and sweet popcorns loaded with butter and sugar eventhough its not healthy i just want to make out as my lil ones enjoy having them, finally i googled for this crunchy popcorns and i crossed here which seems quite easy and prefect for me which i prepared with less butter and replaced corn syrup with honey,finally i prepared a large bowl of pop corns and prepared this vanilla flavoured popcorn crunch..we loved it and the whole large bowl vanished within few hours and my lil one really enjoyed munching these crunchy beauties..
Preheat the oven to 200F and take the popped corns in a large bowl also arrange a baking sheet over a baking tray..Heat the sugar, butter, honey with salt in a pan, bring boil and simmer for few minutes until the sugar get well dissolved..remove the pan from heat and add the baking soda and vanilla extract..mixture will become foamy...add this foamy syrup to the pop corns, mix well until the pop corns get coated, dont worry if the corns didnt get well coated it will happens while baking..
Pour this over the baking sheet and bake for 40-45minutes (stir every 15 minutes)..remove the tray from the oven and break them slightly, conserve them in air tightened box and enjoy..
Poppy seeds is an important spice in Indian cuisine specially in Bengali cuisine...They are added for thickness, texture and also give added flavor to the recipe. Commonly used in the preparation of Kurma, ground poppy seed along with coconut and other spices, are combined as the masala to be added at the end of the cooking step. It is quite hard to grind them when raw, so they are normally dry fried, and then mixed with a little water to get the right paste consistency...The seeds are used as a spice, a condiment, a decorative garnish, a thickener, and a main ingredient. They are used in many baked goods, main course dishes, and desserts.I want to make out a side dish using coriander leaves,mint leaves but finally i finished it as hara bara gobi and channa posto where i used poppyseeds in the grounded paste i prepared with coriander leaves and mint leaves..Finally i finished as a delicious, beautiful greeny side dish which tasted marvellous as side dish with rotis..we loved it ..I was really happy of my new side dish and we enjoyed with both rasam rice and chappathis. Grind all the ingredients given in the list 'To Grind' as fine paste without water..Heat enough oil and let splutters the mustard seeds and curry leaves, add the grounded paste and saute for few minutes until the raw smell goes away..now add the cauliflower florets,salt and already soaked & cooked chickpeas, cook everything in simmer, sprinkle few drops of water if needed for cooking...put off the stove once the water gets evaporates.. I was completely fallen in love with roasted veggies soups nowadays, after making out creamy and delicious Roasted Cauliflower Soup, here is an eye catching and flavourful roasted tomato soup prepared with rolled oats and spices ..I have prepared this soup by roasting the tomato chunks,diced onions with minced garlic cloves and spiced with fresh thymn leaves in oven for half an hour , then cooked them in vegetable broth with rolling oats which i have finally blended as thick soup..This soup served warm tastes marvellous and suits prefectly for cold winter dinners with toasted bread.. its such a filling, flavourful and beautiful colour soup everyone at home liked it much and we enjoyed having this healthy soup with some home made cheesy pizza with bellpeppers and onions..both soup and pizza turned out our dinner too fabulous and my H asked to me to prepared this roasted tomato & oats soup often, as he liked it much..
Preheat the oven to 350F, line a baking tray with a baking sheet, toss the chopped tomato chunks, diced onion, minced garlic cloves, thymn leaves, pepper powder and salt with olive oil and place the veggies over the baking sheet..roast them for half an hour by stirring occasionally..
Bring boil the vegetable broth, add the roasted veggies and cook in simmer, add the rolled oats and cook for few minutes until the oats get well cooked...blend the soup with hand blender..
Garnish the soup with fresh cream and green spring onions and serve hot! Its quite a simple and easy cake with yogurt, i usually prepare this simple yogurt cake sometimes for our evening snack as they go for easy ingredients like all purpose flour, eggs, sugar,oil and baking powder..This time i prepared this easy cake with half all purpose flour and half corn flour to make out soft and spongy cake as corn flour tends to make the bakes soft and spongy..Else i used dark chocolate powder instead of chocolate chunks and i used finely chopped apple chunks instead of grating apple which turned out this delicious cake more yummy and prefect..my lil ones loved this chunky apple and yogurt cake for their breakfast with a cup of chocolate which suits incredibly for this cold winter morning..
Preheat the oven to 350F...Transfer the yogurt in a bowl and wash the yogurt cup..Keep aside,we need it for measuring the other ingredients..mix both the flours and baking powder and keep aside..
Add the eggs, sugar and beat until they turns soft, now add the oil and yogurt to the sugar-egg mixture and beat again everything for a while...now add the flours, chocolate powder and stir well until everything get well mixed.Meanwhile mix a tsp of flour to the finely chopped apples and mix it well, this helps the apples not to get down once the batter starts baking..add the floured apple chunks finally to the cake batter and pour this batter into a greased baking pan, springle few apple chunks over the batter and bake for 35-40minutes in middle rack..
Last week when we went for purchasing at Indian groceries, i picked few bottlegourd as they were really fresh and green, back home i want to make out some side dish for rotis and finally i changed my mind and prepared this quick, easy and really delicious creamy kheer sith finely grated bottlegourd pieces as my sweet tooth was craving for something since a quite a long...This kheer took just 20minutes to make out in microwave oven, very easy to make out too..Just with half a cup of sweetened condensed milk, milk,sugar,pinch of saffron, cardamom powder and few nuts for garnishing is largely enough to whip out this delicious bottlegourd kheer..
Take the grated bottlegourd pieces,milk and sugar together in a bowl, mix well and cook for 10minutes in high (stir twice in between), after 10 minutes those grated veggies would have cooked well, now add the condensed milk, saffron and cook again for 10minutes in high (stir twice)..now add the cardamom powder and stir until the cardamom powder get well mixed.. Serve warm, garnish with few pistachio nuts..
Preheat the oven to 350F and grease the muffins mould, i used the silicon mini muffins mould so i didnt greased my moulds...Mix together the all purpose flour, yellow cornmeal, pepper powder, salt, baking powder and baking soda together.. now add the bellpepper chunks, chopped parsley leaves and spring onion to the dry ingredients and gradually add the olive oil and turn everything as crumble like mixture, slowly add the hot water, mix everything well until they turn as thick batter..
Pour the batter to muffins mould, i used the 12 muffins mould..arrange the mould in the middle rack of the oven and bake for 15-20minutes until the muffins turns golden brown or a skewer inserted come out clean.. Serve warm with any salads or soups for dinner or simply with a cup of milk for snacks..
Take the chopped zucchini, chopped onion, chopped garlic cloves, parsley leaves, cumin with enough salt and water, cook everything in medium high flame for few minutes, simmer for 10minutes until the veggies get cooked well..
Add the cheese, pepper powder and blend the soup with handblender until they turns creamy.. Serve hot..
Christmas is around and here everyone is really excited to enjoy the upcoming christmas holidays, yes from next week onwards we are going to be in christmas vacation..Waiting eagerly to go around during this christmas vacations, also for shopping..My lil ones are really getting ready with their big shopping list , its time to spend money and having some festive foods..Today i prepared some dry fruits and nuts cake to start our christmas feast, christmas is somewat diwali for us coz here all are in christmas fever....so its quite a festive time for everyone at home..I have prepared this yummyilicious cake with some dry fruits and nuts soaked in rhum before few days back and today i made this cake with condensed milk just to change my usual way of making out cakes...Usually i used to soak dry fruits and nut in rhum before a month back but this time i was bit lazy and i prepared them 10days back, eventhough those soaked nuts and fruits were prefect to make out this gorgeous cake..Delicious christmas cake with condensed milk tastes marvellous with a cup of hot coffee..
Soak all these fruits and nuts in rhum in an air tightened bottle before a month or few weeks..store everything in fridge , can use for making cakes furtherly..
Preheat the oven to 350F and line a baking sheet in a loaf mould... grease the baking sheet, keep aside..Beat the butter and sugar until they turns creamy, add the eggs one by one and the sweetened condensed milk to the butter and sugar mixture until everything turns soft...meanwhile sift the flour and baking powder, keep aside....Add the sifted flour, vanilla essence and soaked fruits and nuts to the egg-sugar mixture, mix everything well with a spatula until everything get well mixed, dont use beater, this may break the fruits also dont over mix..
Pour the cake batter to the already prepared loaf mould and bake in middle rack for 45minutes or until the skewers insert come out clean.. Spread the nutell on a slice of bread and make a sandwich with another bread slice, make out 3 sandwiches with 6slices of bread, meanwhile beat the egg, milk, vanilla extract, cinnamon powder,sugar and salt..
Heat the butter or oil in a pan..gently dip the already prepared sandwich to the egg mixture and cook the sandwich on both sides until they get well cooked.. Serve hot topped with confectionner's sugar..
Let me say first of all a big thanks to DK for giving the opportunity to host A.W.E.D event..AWED means A Worldly Epicurean Delight is an event started by DK of Chef In You , where each and every month a new cuisine is chosen, this month i got an opportunity to host this incredible event and i have choosed Portuguese cuisine as theme..After going to so many various cuisine, lets stop at Portugal to try out many wonderful dishes..
Portugal, officially the Portuguese Republic is located in the west and southwest parts of the Iberian Peninsula in southwestern Europe, and is the western most country in continental Europe. 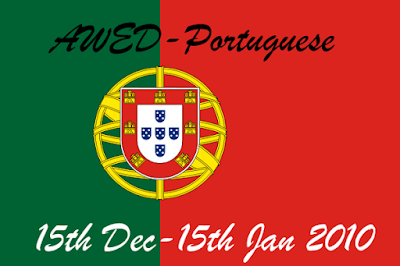 1) Prepare any dish that should be vegetarian (eggs and dairy products are allowed), non-vegetarians are not accepted..
2)Post as many Portuguese dishes as u can in your blog from today onwards..many entries per person are allowed..
3)Link back ur entry to this A.W.E.D- Portuguese page and to DK's AWED Page..
4)If u have any tips or any interesting stories about Portugal, its will be so useful, dont forget to send.. Please take care to send all ur delicious entries before 15th January 2010..
8) If u dont have blog, no problem..pls do send ur entries to the above mail address, i'll include them while doing the roundup.. Boil a cup water in a bowl, add salt to it.When the water starts boiling, remove from stove and add ajwain, red chilli powder, turmeric and flours. Stir with a ladle to make sure it is mixed well. Pour ghee on it and cover.Once it cools, knead it to form smooth dough. Pinch out small balls of dough and roll them like threads between your palm, bring the ends together to form into small rings..
Fry them in hot oil til they turn golden in colour. Enjoy with hot coffee..
Rasgulla are known as bengali sweets, the most famous sweet prepared with paneer, cooked in sugar syrup..Rasgullas are always my favourite, i really want to make them some wat healthy and i tried making out rasgullas by adding some quick cooking oats with some fresh paneer which i prepared at home with full fat milk..They turned out really tremendous and even i was surprised to see this trial turned out fantastic..even my DH and everyone at home were surprised to hear that i prepared this rasgullas with oats, none will find out that much easily the oats u have added in this rasgullas when u serve this gorgeous juicy balls unless you tell them the secret ingredient the famous oats..These oats rasgullas tastes really fantastic when served chilled..
Heat the milk n bring it to boil, add the lemon juice n turn them until the milk curdle.. now pass the curdled milk through a muslin cloth..keep aside the whey.. wash out the curdled milk thrice with cold water to get rid from the lemony flavour...tie the both ends of the cloth n hang them for atleast 6hours.. Meanwhile prepare the sugar syrup, boil the water and the sugar, cook them until it becomes a single string constitency...now put the goal ball size paneer balls to the syrup, add the rose water n cook them well until they start floating.. Weekend i soaked as usual few packets of dry legumes and freezed them for using them later, i pressure cooked some chickpeas and prepared this deep fried balls with some left over bread slices which i soaked them for few minutes in water, finally which i combined together with those pressure cooked and mashed chickpeas puree spiced with parsley leaves, green onions, garlic, cumin powder and pepper powder, yea its ressembles quite like falafel, the famous chickpeas fritters but as i used bread in this deep fried balls i dont want to confuse the traditional dish by giving them the name as falafel..We enjoyed having this deep fried crispy balls for our snacks with some ketchup, as they are mild in spice even the small ones at home love this and a prefect evening snacks for everyone.. Grind the pressure cooked chickpeas,green onions, parsley leaves, garlic cloves and cumin seeds as fine paste..meanwhile soak the bread slices in water, squeeze out the excess of water and keep the soaked bread aside...Add the grounded chickpeas paste with soaked bread, add the pepper powder, salt and all purpose flour and turn everything as stiff dough(the paste shouldnt stick in ur palms while making them balls, dont hesitate to add the flour)..make small balls from the dough and keep aside..
Heat enough oil, drop gently the balls and deep fry them until golden brown..serve hot with ketchup!! 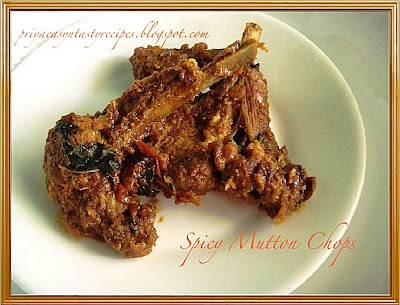 Our's today's lunch goes for some spicy mutton briyani and this delicious mutton chops..its quite rare i can get this mutton chops from supermarket as sometimes i dont even in mood to cook out, eventhough everyone at home love this spicy mutton chops..When i was kid, my mom used to make out delicious dishes through goat meat and its quiet a hard time for me to eat those delicious as i hate goat meats, but now i was completely against this, yea i love goat meats and i usually bought goat meats from indian stores where they sell tender meats as same like in India, yesterdary while doing my shopping in Indian groceries i saw some fresh mutton chops and i bought them immediately,which i prepared as this spicy mutton chops..we enjoyed having this spicy mutton chops and its tastes too prefect with rasam rice..
Wash thoroughly the goat chops with ginger garlic paste,yogurt,turmeric powder, salt and let them sit for an hour in fridge..
For the first time am trying out cookies with cornmeal, both cornmeal and tutty fruity together works out wonder and the cookies turned out really prefect, crunchy and marvellous..My lil ones at home loved that crunchiness of this cookies and as i have used butter in this cookies its was really too tasty and yummy quite similar like butter cookies..Also this cornmeal cookies is eggless and prefect evening snacks with some hot coffee or hot chocolate...Even my daughter's friend carried few cookies to her home saying that she is gonna ask her mom to make out some cookies..Watelse to say, am soo happy to see my cookies vanished within few minutes where i used tutty fruity chunks to make out more gorgeous.. Beat together the butter and sugar until they turns soft and creamy..add the vanilla extract and give a stir, add the flour, cornmeal, baking powder,salt and tutty fruity chunks and mix well..Meanwhile preheat the oven to 350F, line a baking sheet over a baking tray, grease the baking sheet..drop a tablespoon of dough or roll a golf ball size dough and flatten them , arrange over the greased baking sheet with same space in between and bake for 15 minutes or until they lightly brown.. Arrange in air tightened box and enjoy for snacks!! Roasted Cauliflower Soup is a great French soup recipe to make when you need something delicious, fast, and full of fiber. As my DH wont like cauliflowers much i have added few carrot chunks to this soup else u can very well prepared this soup just with cauliflower soup, its very easy to make and its a prefect dinner with a simple salad and toasted bread slices for a cold winter dinners...This roasted cauliflower soup goes for cauliflower florets roasted in oven with carrots, onions, garlic cloves and fresh thyme spiced with pepper powder and salt then cooked with vegetable stock and finally blended as creamy soup..Because of the heavy cream used in the recipe, it’s not low in fat, but u can very well used half and half milk or low fat cream to this soup to make them creamy, i love this soup with heavy cream and i went for it...Such a hearty and filling soup, even the small ones at home love this..
Preheat the oven to 425F. Toss cauliflower,carrots, onions, and garlic together in a large roasting pan. Drizzle the vegetables with the oil, season them with the pepper and thyme, and toss lightly to coat. Roast the vegetables uncovered for 25-35 minutes, stirring occasionally, until they turn golden brown. Place the roasted vegetables into a large pan with the vegetable stock and bring to a simmer for 5 minutes. Add the heavy cream and salt, cook for few minutes. Puree the soup with a hand blender. Serve hot. Crispy vadais made with soaked and coarsely grounded channadal along with thin poha prepared with onions, green chillies, ginger, garlic..Yea i have added poha in this crispy fritters just to give a change to our usual masal vadai.. both channadal and poha together works out wonder and they turned this masala vadai extremely crispy and tasty..These vadais suits prefectly for evening snacks with coconut chutney..I prepared this delicious combination for our evening snacks as i had some sudden visits and wanted to make out some crispies and went through my pantry where i found some channadal and i soaked them immediately, but they were nt that much sufficient and i finally soaked the thin poha until they turn soft (its takes few seconds), i drained the excess water and added with the coarsely grounded spiced channadal mixture and fried them as vadais...My friends find it out so crispy and they started discussing about whether i would have added anything specially for the crispyness and i cleared their doubt by saying that i used poha in those crispies, we enjoyed having this spicy, crispy poha vadai.. Drain the excess of the water from the channadal and grind the dal coarsely without adding water, if its too hard to grind just springle few drops of water..now add the chopped onions, chopped green chillies, ginger pieces, crushed garlic,chopped curry leaves, coriander leaves, crushed fennel seeds with enough salt to the grounded batter, meawhile soak the thin poha in a cup of water, once they turn soft drain the excess of water, squeeze out the excess water, add this poha to the channadal mixture and mix everything well. Jamaican cornmeal porridge is such a delightful and healthy porridge prepared with yellow cornemal, sweetened condensed milk,vanilla essence spiced with cinnamon powder and nutmeg powder..This is the most common porridge in Jamaica and the old jamaican people call this porridge as pop or cog..It seems Jamaican people believes that this porridge is known as a sort of cleanser because the cornmeal is supposed to be rough enough to mildly pass through the digestive system..Dunno whether its true, anyhow this cornmeal porridge tastes fantastic when they are served warm and my DH relished each and every spoon of this delicious creamy cornmeal porridge.. Mix the cornmeal with half a cup of water, meanwhile bring a cup of water to boil, stir the already prepared cornmeal mixture and salt, cook everything until the cornmeal gets well cooked..Add the condensed milk, vanilla essence, give a stir.. Serve warm topped with cinnamon and nutmeg powder!! enjoy!! Most popular breakfast among Trinidad people is this sada roti, its a plain roti made with white flour and baking powder, coz of its simplicity this roti is made almost everyday for breakfast and serve with Tomato Choka or with eggplant choka..Its a delicious, soft and easy roti prepared with simple ingredients and its one of the most commonly consumed roti in Trinidad and Tobago,where there are shops selling with different curry filling with curried beef, shrimp, chicken or goat also non meat filling with mixed vegetables or potatoes, this roti is so versatile as they can be very well suits for breakfast,lunch or for dinner..I was quite happy trying out this sada roti for our dinner with my tomato choka, both together tastes marvellous..While searching through google, there were many various ingredients are used to make out these sada rotis, but traditionally these rotis are prepared with plain white flour and baking powder with salt and water, while some goes for wheat flour and cornmeal..finally i prepared this soft sada roti by combining wheat flour and plain flour..We enjoyed having this Trinidad's sada roti and we loved it.. Mix together the flours ,salt with baking powder well, knead the flour mix with water as soft and smooth dough..pour the oil in your palms and rub the dough, keep aside for 30minutes closed with wet cloth, divide into 4equal balls and let them sit again for 30minutes...using a rolling pin, roll each balls into a thick disc, heat a tawa in medium flame, put the roti over the hot tawa and cook on both sides until they turns brown..also toast the edges of the roti until they get cooked..
Chokas are simple rustic preparations of vegetables, used as a side dish or filling for breakfast, often served with flatbread or sada roti, prepared in hot pan just like our parathas...These dishes originated with the Indian immigrants in Trinidad and Guyana and among the Trinis its now quite a delicacy, can be prepared very easily though they are not difficult recipes. All these dishes can be refrigerated and reheated very well. Chokas can be very much prepared with eggplants, tomatoes or either with peppers..I tried out the easy and quick chokhas with tomatoes which is grilled and spiced with pounded garlic and hotpeppers tossed with olive oil and serve with finely chopped onions and with some fresh herbs.. Grill the tomatoes for 20minutes in overn turn them twice in between...peel the tomatoes and smash them, meanwhile pound the garlic and pepper as fine paste, add this paste to the mashed tomato, followed by chopped onions,olive oil, chopped basil leaves,salt and mix everything well.. 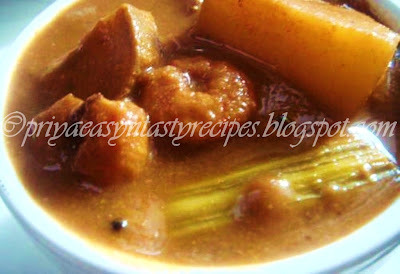 Serve with any flat bread or sada roti (stay tuned will be posting soon).. I can definitely say that i cant live without onions, tomatoes and carrots..i can manage to prepare from appetizier to dessert with these three ingredients..U can guess that i have loads of carrots in my fridge anytime and everytime..I was planning quite a long back to make out cookies with carrots with oatmeal and whole wheat flour, this weekend i tried out this gorgeous cookies with apple sauce,butter and with nuts spiced with ginger powder..I was really happy of this eggless carrots cookies as they were really soft, crunchy and also chewy, even my husband who doesnt love cookies loved these beauties..Needless to say that my lil ones enjoyed having these delicious cookies for their breakfast, as dessert for lunch and for snacks with yogurt...None will guess that u have used carrots in this cookies unless u tell them, yea finely grated carrots chunks get well mingled with quick cooking oats and flours and obviously its an excellent way to feed picky eater who never ever likes carrots. Preheat the oven at 350F, line a baking sheet over a baking pan, grease the sheet...take a small portion from the dough, roll them as small golf sized balls..place this rolled doughs over the greased baking sheet with some space between them and bake for 15-20minutes in middle rack or until they turns golden brown.. Enjoy this delicious gingery carrot cookies!! Pat dry the soaked channadal , meanwhile heat the oil for deep frying and fry those pat dried soaked channa dals until golden brown, drain the excess of oil with a paper towel also fry the curry leaves until crisp...Add the red chilly powder, salt to the deep fried channa dal and toss gently until the chilly powder and salt get well mixed.. Serve as evening snacks..conserve them in an air tightened box..
Whisk the eggs with pepper powder and salt.. Heat the kuzhi paniyaram pan in medium heat, pour few drops of oil n pour a ladle of the whisked eggs, put the flame in simmer n cook slowly, turn on both sides until they get well cooked...dont cook in high flame...keep aside and finish completely the whisked eggs as mini omelettes..
Now add the already prepared mini omelettes to the cooking gravy and put off the stove..let them sit for atleast 10minutes.. I prepared an easy and delicious bread for our breakfast with some leftover and over ripen bananas with almond powder,quick cooking oats, all purpose flour and barley flour as eggless version but not vegan, yea i have used butter and milk to make out this delicious, healthy and prefect breakfast bread for a lazy sunday morning or u r in hurry..With hot coffee or hot chocolate, this bread tastes divine and fantastic and u doesnt even need any spreads to have along with this breakfast bread, the aroma of this bread was really fabulous and they really makes us hungry while they are still in oven and quite an easy bread to prepare too. Preheat the oven to 350F, arrange a baking sheet in a baking loaf mould and grease the sheet,keep aside...Beat well together the sugar and butter until they turns soft and creamy..meanwhile mix together the barley flour, all purpose flour, quick cooking oats and almond powder with baking soda and baking powder in a large bowl, add gradually almond extract, the banana puree and milk to the creamy butter mixture, stir well and slowly add the dry ingredients to the wet ingredients and stir gently..
Pour this over the already prepared baking sheet, springle the almond flakes and bake in middle rack upto 25-30minutes or until the skewers inserted come out clean.. Taste marvellous when served warm.. I have tasted this gingelly oil chicken kurma at one of my friend's place and my better half have completely fallen in love with this delectable dish..Back home, i called my friend and asked her about her chicken kurma and she told that she prepared with gingelly oil along with a home made grounded paste made with shallots, poppyseeds, curry leaves, red chillies, cumin seeds and peppercorns with grated coconut...I have noted everything like a student and i tried out last weekend for our lunch this droolworthy chicken kurma which was really spicy, delicious and tasted too good quite completely a new dish when compared with our usual chicken kurmas, the gingelly oil used in this kurma enhanced the flavour and really changed the taste of this dish..Easy to prepare and i can definitely say that this chicken kurma is truly a feast for chicken lovers and we enjoyed having with hot rice and roti..
Marinate the chicken pieces with yogurt and coriander powder with enough salt atleast for 6hours or overnite.. Grind all the ingredients from the list to grind as fine thick paste and keep aside...heat the gingelly oil and fry the whole spices until they turns brown, add immediately the chopped onions, chopped tomatoes, ginger-garlic paste and saute everything until the raw smell goes away..
Add now the marinated chicken pieces and saute until the chicken pieces get half cooked, now add the grounded paste and cook everything in simmer until the oil gets separates, add enough water and cook everything until the chicken pieces get well cooked...serve hot.. Enjoy this delicious chicken kurma with rice and rotis..
Oats Peda!! yep am very glad to say that this saffron oats peda is one of my own creation which i prepared in microwave oven with ricotta cheese, milk powder and rolled oats with a teaspoon of butter and two pinchs of saffrons..This quick and easy peda takes approximately 25 minutes in microwave oven and tastes marvellous also can definitely say that its quite healthier coz of the oats i have used in this peda..Even people doesnt like to have oats will definitely love this tempting and delicious pedas..I was really happy to see that all my oats pedas vanished within few minutes and everyone at home loved it..I didnt want to prepare my pedas with food colours instead of those food colours i used two pinchs of saffron which also turned out those fabulous pedas more tasty and rich with mild yellow colour..
Take a microwave bowl, add the ricotta cheese, sugar, milk powder, saffron n butter, stir them continously until the cheese gets well mixed, this may looks as creamy paste.. microwave in high temperature for 5 minutes cook this milk mixture, they may doubled their volume, stir them once..meanwhile in a another microwave bowl add a tsp of butter and rolled oats, cook everything for 5minutes in high...add cooked oats to the cheese mixture,cook again in high temperature for 15 minutes in microwave oven..
Keep an eye while doing this, u may see the milk mixture might have turned slightly brownish colour at the edges..now transfer to a flat plate.keep aside n let them cool..once they r slightly cooled shape them as pedas, arrange pistachios pieces over them and serve. Add salt, dhania powder and red chilli powder to the tamarind n tomato juice ,now add this spiced juice to the cooking veggies and prawns,cook everything in high flame..once its boil for the first time add the potatoes pieces to this gravy..cover n let it cook for 10 minutes...put off the stove.. I have bookmarked cumin cookies at Sunita's space..her cumin cookies tempted me a lot and i was really pulled to try out this weekend, but i didnt completely prepared this cumin cookies, i have deduced the quantity of all purpose flour as the original recipe goes for and i have used whole wheat flour and barley flour along all purpose flour to make out this cumin cookies, also i have used pepper powder and crushed cumin seeds to make out this cookies a bit spicy and we enjoyed having this healthy and spicy cookies with cheese spread for our snacks which suits incredibly when its rainy outside.For my surprise, my lil ones loved this spicy cumin and barley cookies with cheese spread and this cookies vanished within few minutes, we loved these cookies when they were still warm..
Preheat the oven to 350F, line a baking sheet over a baking tray..Mix the flours, sugar, salt, crushed cumin seeds, pepper powder and baking soda in a bowl, add gradually the oil and turn everything as crumbly mixture, now add slowly the milk and knead everything as a dough, dont need for a long else the cookies will turn hard. Springle few all purpose flour and roll the dough as large disc with rolling pin, with a cookie cutter cut the dough as circles and arrange over the baking sheet, repeat the process until u finish the dough completely as cookies..Bake for 20-25minutes in middle rack..Serve warm..